The term assassin comes from the Arabic word hashashin, the collective word given to the followers of Hasan-e Sabbah, the head of a secret Persian sect of Ismailities in the eleventh century who would intoxicate themselves with hashish before murdering opponents. The word has since come to refer to the premeditated surprise murder of a prominent individual for political ends. An assassination may be perpetrated by an individual or a group. The act of a lone assassin generally involves jealousy, mental disorder, or a political grudge. The assassination performed by more than one person is usually the result of a social movement or a group plot. Both forms of assassination can have far-reaching consequences. One of the earliest political assassinations in recorded history occurred in Rome on March 15, 44 B.C.E. when members of the Roman aristocracy (led by Gaius Cassius and Marcus Brutus), fearing the power of Julius Caesar, stabbed him to death in the Senate house. Caesar had failed to heed warnings to "Beware the Ides of March," and paid the ultimate price (McConnell 1970). An assassination is usually performed quickly and involves careful planning. The "Thuggee" cult (from which the word thug is derived), which operated in India for several centuries until the British eliminated it in the mid-nineteenth century, consisted of professional killers who committed ritual stranglings of travelers, not for economic or political reasons, but as a sacrifice to the goddess Kali. One thug named Buhram claimed to have strangled 931 people during his forty years as a Thuggee. The eighteenth and nineteenth centuries saw a plethora of assassinations throughout the Western world. Among the most noteworthy were the murders of Jean-Paul Marat and Spencer Perceval. For his role in the French Revolution, Marat was assassinated in his residence with a knife wielded by Charlotte Corday, a twenty-four-year-old French woman, on July 13, 1793. It is uncertain whether she committed the act for patriotic reasons of her own or whether she was acting on orders. On May 11, 1812, John Bellingham entered the lobby of the House of Commons and assassinated the British prime minister, Spencer Perceval, because he refused to heed Bellingham's demand for redress against tsarist Russia. The victim of the most momentous political assassination of the early twentieth century was the Archduke Franz Ferdinand, heir to the Austro-Hungarian Empire of the Hapsburgs, slain during a parade in Sarajevo on June 28, 1914. The assassination helped trigger World War I. The world was shocked once again on October 9, 1934, when King Alexander I, who had assumed a dictatorial role in Yugoslavia in the 1920s in an effort to end quarreling between the Serbs and Croats, was murdered by a professional assassin hired by Croat conspirators led by Ante Pavelich. Russia experienced two major assassinations in the early twentieth century. Having allegedly saved the life of the son of Tsar Nicholas, Grigori Rasputin (the "Mad Monk") gained favor with the Tsarina and, through careful manipulation, became the virtual leader of Russia. However, his byzantine court intrigues, coupled with pro-German activities, led to his assassination on December 29, 1916, by Prince Youssoupoff, husband of the tsar's niece. Ramon Mercader, an agent of the Soviet dictator Joseph Stalin, assassinated Leon Trotsky, who had co-led the Russian Revolution in 1917, in Mexico on August 21, 1940. On January 30, 1948, India suffered the loss of Mahatma Gandhi, murdered by Nathuram Godse, a religious fanatic who feared the consequences of the partition that created Pakistan in 1947. The South Vietnamese leader Ngo Dinh Diem was killed on November 2, 1963, by a Vietnamese tank corps major (whose name was never released) because of his submission to the tyrannical rule of his brother, Ngo Dinh Nhu. The United States experienced a number of major losses to assassins in the twentieth century. Huey Long, an icon in Louisiana politics, was assassinated on September 8, 1935, in the corridor of the capitol building by Carl Weiss, a medical doctor in Baton Rouge and son-in-law of one of Long's many political enemies. Mark David Chapman shot John Lennon, one of the most politically active rock stars of his generation, on December 8, 1980. Attempts were made on other noteworthy men such as George Wallace (May 15, 1972, in Laurel, Maryland) and civil rights leader James Meredith (June 1966 during a march from Memphis, Tennessee to Jackson, Mississippi). The 1960s was an era of unrest in the United States. Civil rights, women's rights, the war in Vietnam, the student movement, and the ecology controversy were major issues. Malcolm X, who advocated black nationalism and armed self-defense as a means of fighting the oppression of African Americans, was murdered on February 21, 1965, by Talmadge Hayer, Norman Butler, and Thomas Johnson, alleged agents of Malcolm's rival Elijah Muhammud of the Nation of Islam. Martin Luther King Jr. was killed on April 4, 1968, in Memphis, Tennessee by James Earl Ray, who later retracted his confession and claimed to be a dupe in an elaborate conspiracy. Robert F. Kennedy, then representing New York State in the U.S. Senate, was shot by a Palestinian, Sirhan Sirhan, on June 5, 1968, in Los Angeles, shortly after winning the California presidential primary. The first attempt to assassinate a sitting president of the United States occurred on January 30, 1835, when Richard Lawrence, an English immigrant, tried to kill President Andrew Jackson on a street in Washington, D.C. Lawrence believed that he was heir to the throne of England and that Jackson stood in his way. He approached the president with a derringer and pulled the trigger at point-blank range. When nothing happened, Lawrence reached in his pocket and pulled out another derringer, which also misfired. Lawrence was tried, judged insane, and sentenced to a mental institution for the rest of his life. On February 15, 1933, while riding in an open car through the streets of Miami, Florida, with Chicago's mayor, Anton Cermak, President Franklin D. Roosevelt nearly lost his life to Giuseppe (Joseph) Zangara, an unemployed New Jersey mill worker who had traveled to Florida seeking employment. Caught up in the throes of the depression and unable to find work, he blamed capitalism and the president. The assassin fired several shots at the presidential vehicle and fatally wounded Cermak and a young woman in the crowd; Roosevelt was not injured. Zangara was executed in the electric chair, remaining unrepentant to the end. While the White House was being renovated in 1950, and Harry Truman and his wife were residing in the poorly protected Blair House nearby, two Puerto Rican nationalists—Oscar Collazo and Grisello Torresola—plotted Truman's death, believing "that the assassination of President Truman might lead to an American Revolution that would provide the Nationalists with an opportunity to lead Puerto Rico to independence" (Smith 2000, p. 3). On November 1, 1950, the two killers attempted to enter the Blair House and kill the president. Truman was not harmed, but in the gun battle that took place, one security guard was fatally shot and two were injured. Torresola was also killed. Collazo, although wounded, survived to be tried, and he was sentenced to death. Not wishing to make him a martyr, Truman commuted his sentence to life in prison. During his presidency in 1979, Jimmy Carter ordered the release of Collazo, and he died in Puerto Rico in 1994. 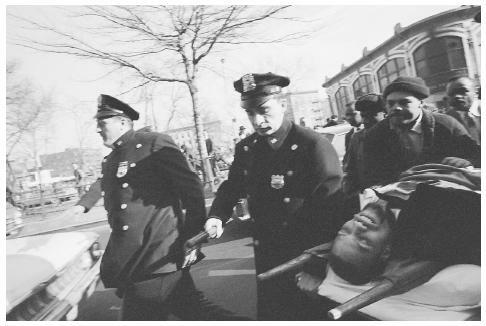 Malcolm X, who fought against the oppression of African Americans, on a stretcher after being shot and killed by assassins on February 21, 1965 .
impress her was to kill the president. Reagan survived major surgery to repair a collapsed lung, and Hinckley was sentenced to a psychiatric facility. President Gerald Ford survived two attempts on his life. On September 5, 1975, while in Sacramento, California, Ford was nearly killed by Lynette "Squeaky" Fromme, a devoted follower of the cult leader Charles Manson. Fromme believed that killing Ford would bring attention to the plight of the California redwood trees and other causes she supported. Fromme was three to four feet from the President and about to fire a .45-caliber handgun when she was thwarted by Secret Service agents. Seventeen days later, in San Francisco, Sara Jane Moore, a civil rights activist, attempted to take the president's life. Moore was a member of a radical group and believed she could prove her allegiance by killing the president. Both women were sentenced to life imprisonment. Theodore Roosevelt was the only former president to face an assassination attempt. In 1912, after serving two terms as president, Roosevelt decided to seek a third term at the head of the Bull Moose Party. The idea of a third-term president was disturbing to many because no president theretofore had ever served more than two consecutive terms. A German immigrant, John Shrank, decided that the only way to settle the issue was to kill Roosevelt. On October 14, 1912, at a political rally, Shrank fired a bullet that went through fifty pages of speech notes, a glasses case made of steel, and Roosevelt's chest, penetrating a lung. Covered with blood, Roosevelt completed his speech before being treated. Shrank was adjudicated as mentally ill and spent the rest of his life in a mental institution. The first president to be assassinated was Abraham Lincoln on April 14, 1865. Believing that he could avenge the loss of the South in the U.S. Civil War, the actor John Wilkes Booth entered the President's box at the Ford Theater in Washington, D.C., where Lincoln had gone with friends and family to see a play. Booth fired a bullet into the back of the President's head and then leaped from the stage shouting, "sic semper tyrannis!" and "The South is avenged!" Despite fracturing his shinbone, he successfully escaped. Twelve days later, Booth was trapped in a Virginia barn and killed when he refused to surrender. The coconspirators in the murder were hanged. James A. Garfield was shot once in the arm and once in the back on July 1, 1881, in a Baltimore and Potomac train station on his way to deliver a speech in Massachusetts. Charles Guiteau, the assassin, had supported the president's candidacy and erroneously believed that he had earned a political appointment in Garfield's administration. When he was rejected, the killer blamed the president. Garfield survived for seventy-nine days before succumbing to his wound. Guiteau was hanged on June 30, 1882, at the District of Columbia jail. In September 1901 President William McKinley traveled to the Pan-American Exposition in Buffalo, New York, to give a speech on American economic prosperity. While greeting an assembled crowd on September 6, he encountered twentyeight-year-old Leon Czolgosz, a laborer and self-professed anarchist. The assassin approached McKinley with a handkerchief wrapped around his wrist, and when the President reached to shake his hand, Czolgosz produced a .32-caliber pistol and fired two shots into the chief executive's abdomen. McKinley died eight days later from gangrene that developed because of inadequate medical treatment. Czolgosz was executed, exclaiming that he was "not sorry" (Nash 1973, p. 143). On November 22, 1963, while traveling in a motorcade through the streets of Dallas, Texas, John F. Kennedy became the fourth U.S. president to be assassinated. Lee Harvey Oswald, a communist malcontent, was accused of the crime and all evidence pointed to his guilt. However, before he could be adjudicated, Jack Ruby, a Texas nightclub owner, killed Oswald. Oswald's motivation for killing Kennedy has never been fully determined: "The only conclusion reached was that he acted alone and for vague political reasons" (Nash 1973, p. 430). Conspiracy theories concerning the murder have not been substantiated. Bak, Richard. The Day Lincoln was Shot: An Illustrated Chronicle . Dallas, TX: Taylor, 1998. Barkan, Steven E. Criminology: A Sociological Understanding . Upper Saddle River, NJ: Prentice Hall, 2001. Bruce, George. The Stranglers: The Cult of Thuggee and Its Overthrow in British India . New York: Harcourt, Brace & World, 1968. Bresler, Fenton. Who Killed John Lennon? New York: St. Martin's Press, 1998. Cavendish, Marshall. Assassinations: The Murders That Changed History . London: Marshall Cavendish, 1975. Gardner, Joseph L. Departing Glory: Theodore Roosevelt as Ex-President . New York: Charles Scribner's Sons, 1973. Lesberg, Sandy. Assassination in Our Time . New York: Peebles Press International, 1976. McConnell, Brian. The History of Assassination . Nashville: Aurora, 1970. McKinley, James. Assassinations in America . New York: Harper and Row, 1977. Nash, Jay Robert. Bloodletters and Badmen . New York: M. Evans and Co., 1973. Remini, Robert V. Andrew Jackson and the Course of American Democracy, 1833–1845 . New York: Harper & Row, 1984. Roy, Parama. "Discovering India, Imagining Thuggee." The Yale Journal of Criticism 9 (1996):121–143. Strober, Deborah H., and Gergald S. Strober. Reagan: The Man and His Presidency . New York: Houghton Mifflin, 1998. "The Assassination of Huey Long." In the Louisiana Almanac [web site]. Available from http://louisianahistory.ourfamily.com/assassination.html . Smith, Elbert B. "Shoot Out on Pennsylvania Avenue." In the HistoryNet at About.com [web site]. Available from www.historynet.com/Americanhistory/articles/1998/06982_text.htm .